Brigadier General Stand Watie, Confederate Army, was commissioned as a Colonel in the First Cherokee Mounted Rifles in October 1861. Under his command, two regiments and three battalions of Cherokee, Seminole, and Osage infantry fought throughout Indian Territory, Arkansas, Missouri, Kansas, and Texas, and won a number of significant battles. In 1865, Stand Watie surrendered to Union forces, the last general in the Confederate Army to do so. Born on December 12, 1806, near New Echota in the Cherokee Nation, East, in present Gordon County, Georgia, Stand Watie was given the Cherokee name Degadoga, meaning "he stands," at birth. He was a son of a full-blood Cherokee named Oo-wa-tie and his half-blood wife, Susanna Reese. 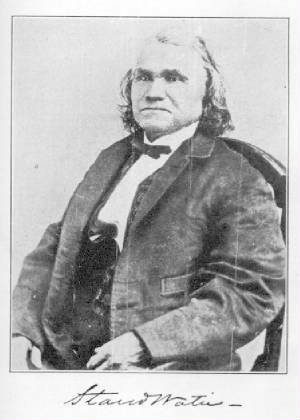 When Oo-wa-tie was baptized into the Moravian Church as David Watie, he renamed Degodoga Isaac S. Watie; Watie later dropped Isaac and combined his Cherokee and Christian names into Stand Watie. Watie's older brother was named Buck, but he changed his name to Elias Boudinot. Watie's uncle was the Ridge, who became known as Major Ridge, and his cousin was John Ridge. Together they formed the powerful Ridge-Watie-Boudinot faction in Cherokee politics. Watie received his formal education at the Moravian Mission School at Springplace, Georgia. He remained aloof from tribal politics until 1836 when he signed the 1835 Treaty of New Echota, by which a group of Cherokees surrendered the ancient Cherokee homeland for a new domain in present Oklahoma. The Ridge-Watie-Boudinot faction migrated to the Cherokee Nation, West, with little difficulty in March 1837. Watie established his home in the northeastern corner of the Cherokee Nation, along Honey Creek. Daughters of Stand Watie, ca. 1870. As a signatory of the removal treaty Watie had forfeited his life under the Cherokee blood law, which prescribed the death penalty for anyone alienating tribal land. When the penalty was extracted in June 1839, only Watie among Major Ridge, John Ridge, and Elias Boudinot escaped execution. Thrust into the forefront of Cherokee politics by the killings, Watie became the lifelong enemy of Principal Chief of the Cherokee Nation John Ross. With the onset of the American Civil War Ross wavered in forming a Cherokee-Confederate alliance. However, Watie accepted a commission as a colonel in the Confederate States Army and raised the First Regiment of Cherokee Mounted Volunteers. Fearing a coup, Ross reluctantly agreed to a Cherokee-Confederate alliance. However, when the opportunity arose, Ross fled to Federal-controlled territory. In August 1862, Watie replaced Ross as principal chief. In spite of early successes, by the winter of 1862-63 the Confederate hold on the Cherokee Nation was slipping. Nonetheless, Watie's Regiment continued to harass Federal forces. In June and September 1864, Watie scored his greatest military feats in the capture of the Union steamboat J. R. Williams and the Second Battle of Cabin Creek. In May 1864 Watie was promoted to brigadier general, and in February 1865 he was placed in command of the Indian Division of Indian Territory. However, by then the war was lost. Watie surrendered on June 23, 1865. He was the last Confederate general to do so. Afterward, he served as a member of the pro-Southern Cherokee delegation to the Fort Smith Council in September 1865. 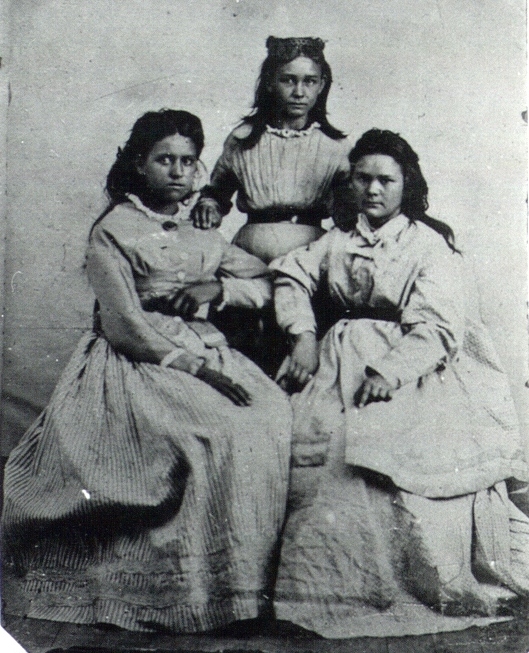 After the Civil War, Watie remained in exile in the Choctaw Nation until 1867. He then returned to Honey Creek to rebuild his home. He died there on September 9, 1871. He was buried in the old Ridge Cemetery, later called Polson's Cemetery, in Delaware County, Oklahoma. Stand Watie had four wives Eleanor Looney, Elizabeth Fields, Isabella Hicks, and Sarah Caroline Bell. Elizabeth Fields's and Watie's child died during childbirth in 1836. He married Sarah Caroline Bell in 1842. They had three sons and two daughters. All died without issue. BIBLIOGRAPHY: Edward E. Dale and Gaston Litton, ed., Cherokee Cavaliers: Forty Years of Cherokee History as Told in the Correspondence of the Ridge-Watie-Boudinot Family (Norman: University of Oklahoma Press, 1939). Kenny A. Franks, Stand Watie and the Agony of the Cherokee Nation (Memphis, Tenn.: Memphis State University Press, 1979). Morris L. Wardell, A Political History of the Cherokee Nation, 1838-1907 (Norman: University of Oklahoma Press, 1938). Grace Steele Woodward, The Cherokees (Norman: University of Oklahoma Press, 1963). Kenny A. Franks, © Oklahoma Historical Society; photo Stand Watie courtesy National Archives; photo of daughters: Image #16978 in the Stand Watie Collection. No one questions the horrific impact of the Civil War on America, but few realize its effect on American Indians. Residents of Indian Territory found the war especially devastating. Their homeland was beset not only by regular army operations but also by guerrillas and bushwhackers. Complicating the situation even further, Cherokee men fought for the Union as well as the Confederacy and created their own "brothers' war." About the Author: Clarissa W. Confer is Assistant Professor of History at California University of Pennsylvania.